Got this from Steve to play with.. works out of box GREAT! I grabbed some vid along the way for those that might be interested. Video is short in four sections, first template, second template, polish and test point. Ah, that's great news, last week I thought about making such a template myself using the knife template as a guide. But I will wait till this one comes up for sale. Wow great! time ago i was talking with Steve about this point i had send to He some photos of a template prototype that i had make too,and is not very difficult sharp it with a template, i'm happy to see that maybe will be avaible some type of template for this point! I like using the onglette or what the jewelers here on Philadelphia's Jeweler’s Row call a "Shad Belly" due to the fish belly shape of the graver. This would be a great improvement over the commonly purchased onglette gravers in that they do not come in HS Steel, and tend to dull quickly. Having a High-speed Steel or super hard onglette would be a great improvement. One question: I assume that how much you grind the curvature would determine how thin the graver would be, am I correct? And when do you think this template will be available for purchase? Paolo, thank you too! The onglette is similar to the pics of the template you made some time ago, but with flats and curve between. The flats help to keep from rocking too far as they act a bit like a stop when grinding. Hi Bram, what you're saying about the two angles for the face is what my father does too for making a left or right side cutting graver. Here are pics of the new templates. That one 50-60 template has the two angles for the face. The other 50-60 template is the same but with a straight face. This two angle face template could be used on the onglette point too. Great set, this gives an awsome onglette. Thanks Steve for bringing this on the market. Strange, what ever I try I can´t go to page 2 in this thread, try now by placing this writing. I'll post here when the shopsite is updated with them. Hopefully before or during the weekend. Will all of the templates you've shown in the picture be available after this weekend or just the Onglette? I've always wondered about angling the top of a graver, I figured it would help shave side walls, is that correct and are there other purposes for that angle as well? Hi Mark, Yes, all in the picture will be available. That is correct about one of the uses is for shaving side walls.. and that is the purpose for the one with the double angled face. To make a left or right with it you push the pin so it protrudes from one side of the template or the other. This way one template can be used to make a left or right. When shaving the side wall you may or may not want to put the heel on. If not, you wouldn't use the V part of the large template. These new templates are ready to go and are on the shopsite now. Scroll down a bit on either of these pages to find them. Same here Steve, thank you for making this possible. read with pinch of salt ready.. I use the onglette as per the Robert Wooding and Blaine Lewis setting books/videos for cutting borders around grain/pave set and for fine wall cutting and cleanup around prongs. I also use it to lift grains in tight corners where a round graver wont do. I use it to split beads in micropave, lastly I also use it to cut keel lines in round wire claws for princess cut setting. Thank you for the videos on the onglette templates.They were informative. I placed a request for a set. Chris,What happen to you videos on stone setting with the onglette?:cheers2J.J. I am at an awkward place with engraving/setting right now. basically I cannot bring work home, value and insurance issues, and I cannot fit my tools at work... so im kind of at an impasse.. I have been setting, lots actually, but manually. 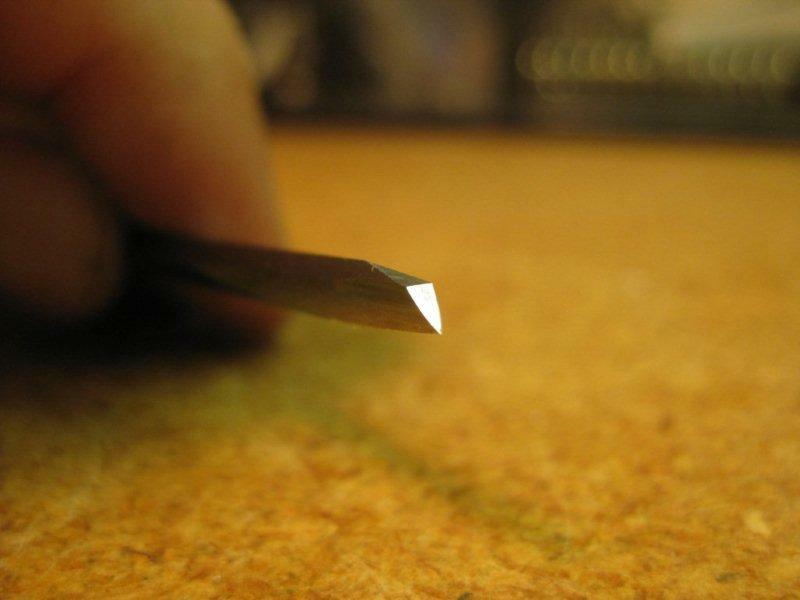 I`m debating trying this... i`ve given up with the knife point for cutting as i`ve had nothing but broken points with it...however it is great for adjusting channel stones spacing. I`ve been using a bulino point for cuttting threads & also for bearings of channels with no problems whatsoever. 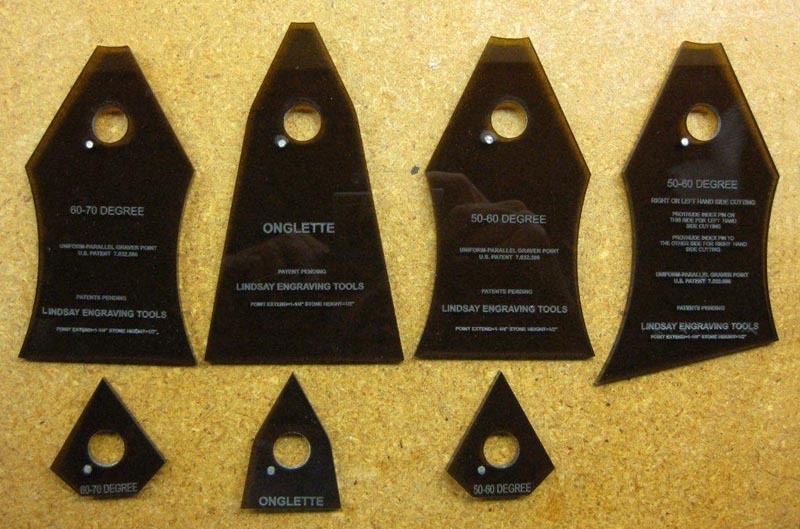 Having used an onglette for years i honestly can`t see major difference the cut makes to some of the points already available. I have also a lot of point breakage, what type of graver do you use instead Monk. I also tryed the knive graver but that was even worse, seems to me this onglette template produces a litlle wider graver which give less problems in my opinion. I used to get on very well with yellow tang vallorbe ongletttes, however that was when working by hand & sharpening with a few swipes on the stone every few minutes. Not really ideal doing the same with the template. Im very new in engraving, and just aquired an onglet and sharp V template set, and im working in sharpening this blanks. My doubt is: Should i put heels on those graves or not? Put heels in some, put heels in all, or no put heel on those at all? Can any person tell me some about this issue? Hi Duede, To put heel on or not would depend what you want it to do. For lines put the heels on so that the graver does not dive. If making bulino dots you want the graver to dive so leave the heels off for that. Jewelers sometimes leave the heels off when stone setting.